The Fiddler’s Inn at 9219 35th Ave NE in Wedgwood has a history which dates back to the end of Prohibition on December 5, 1933, when beer and wine again could be sold to the public. The founder and original owner of the Fiddler’s Inn, Walt Haines, grew up on a farm but dreamed of a life in the world of music and entertainment. He had a successful career as a professional musician in Seattle until the economic depression years of the 1930s. When Prohibition ended Walt Haines thought of opening a tavern as another source of income. NOTE: All rights reserved under Creative Commons Copyright. Do not copy text or photos from this article. Walter Haines was born December 17, 1904, in Illinois but grew up on a farm near Mitchell, South Dakota. His father, John, had moved his family to fulfill his own dream of being a farmer, and he brought up his children on the values of farm life and hard work. Walter’s farm chores began at age six with taking the sheep to and from pasture each day. John Haines was determined that Walt and his older brother, Les, should become farmers, but the boys had other ideas. Walt and Les had a classmate at their one-room country school who subscribed to a Hollywood movie magazine. Each month he would let Walt and Les look at the magazine, and the boys were bitten by the “show-biz” bug. Their heads were full of Hollywood! The boys knew they had talent and they thirsted for musical training, but their father would not permit it. One afternoon when his parents were not home, Walter took the motor off the family washing machine, went into town and traded the motor for a cornet (a small brass horn.) He knew he would get a whipping for what he had done, but he wanted to have his horn. On New Year’s Day, 1919, Walt’s brother, Les, received a scolding from their father for not having milked the cows properly. All of a sudden Les said, “All right, this is it! I’ll never milk again! I’m leaving!” Les walked out, and Walt went with him. Walt was fourteen and Les fifteen years old, and what one did, the other did. In the freezing weather Walt and Les walked away from the farm and went into town. They got a job guarding tools at a construction site. The construction was right next door to the town’s hotel, so Walt and Les would take turns running into the hotel lobby to get warm. When one of the bellboys at the hotel left, Les got his job. Walt still had to guard the tools, but a few days later a busboy at the hotel left, so Walt got that job. The boys did eventually return home to live but they continued to work in town. They saved money for their dreamed-of future trip to Hollywood, where they planned to begin careers in show business. When the boys had saved up $300, they divided the money, put it in the lining of their shoes, and hopped a train out to Portland, Oregon. There they again got jobs while they took music studies, Les the violin and Walt his horn. They also took tap dancing lessons because they thought this would be a useful skill in Hollywood. The next summer the boys took jobs at a resort near Seattle. From there, Les got a job on a President Line ship, and was away for the next several years working on cruises, leaving Walt to make his own way in the music business in Seattle in the early 1920’s. Seattle musicians advised Walt to take up the tuba and the bass (the largest-sized, lowest-toned instrument in the violin family), instruments which few other people played. They thought that being able to play a variety of instruments would help Walt get jobs. Walt took lessons, and with the great musical ability he had, he was soon able to play the tuba and bass well. Walt learned that the orchestra at the Olympic Hotel needed a bass player. He applied for the job and got it. At the ripe old age of sixteen, Walt joined the musician’s union and launched his career as a professional musician. It is not known why Walt never did go to Hollywood, but the music and entertainment scene was lively in Seattle in the 1920’s so Walt found plenty of work. Musicians from New York sometimes came to Seattle on tour and they told Walt about the great opportunities back there and the big money that could be made. Walt and another musician were invited to go to New York City and play with a band that was going to record for the Columbia label. They went to New York, arriving October 29, 1929 — the day of the Panic on Wall Street which began the Great Depression. The city was in an uproar, and everything was closed down. Walt and his friend could not find the people they were supposed to meet in New York. They hung around for a few days, wondering what to do next. Their money was getting low, so Walt sent a wire to the orchestra leader in Seattle, asking if he could have his job back. He got an answering wire that said his job was waiting for him, so Walt and his friend made their way home to Seattle as fast as they could. Walt Haines (right) with his tuba. The note on the photo says, “To Walt Haines to hang in his tavern! !, Tommy Thomas, October 1938.” Photo used by permission of the Haines family; do not copy. Walt had learned that Joe Tada, a big-band musician in New York, had an eight-foot tuba, reputedly the only one in existence. Walt decided to change that. He found out the name of the manufacturer and had them make him a tuba exactly like the one Tada had. Walt had a great sense of showmanship, and he felt that his eight-foot tuba would add flair to his act. One day Walt was walking in downtown Seattle, carrying his eight-foot tuba which nearly dwarfed him as he weighed only about 125 pounds. A man stopped him and asked, “Where are you going with that thing? !” Walt replied that he was going to rehearsal, and told the man where he was playing. The man turned out to be a representative for the Fox Fifth Avenue Theater, and he hired Walt to play there. Walt married at age 21 in 1925, and his wife Bobbie was a chorus girl in the theater show. In 1928, one of the other chorus girls had a baby, and Walt and Bobbie adopted the baby girl, whom they named Geraldine (“Gerry.”) Their happy family life did not last, however. In 1932 Bobbie ran off to Alaska with another man. Walt immediately went to court, got a divorce and was awarded sole custody of little Gerry. Gerry was only three years old, so to get help with her care Walt moved in with his brother, Les, and Les’s wife Jewell, who were living in the Wallingford area. That year, 1932, one of the darkest years in U.S. history, was also a low point in Walt’s life. Because of the economic depression people no longer had money to go out for music and entertainment, so jobs in the music business were increasingly hard to find. Walt had lost his wife and home, and now his livelihood was threatened as well. He continued to get theater orchestra and dance-band work where he could, but live orchestras had been taken out of theaters and canned music put in instead. Movies had become “talkies” instead of silent pictures with musical accompaniment. In 1994 just before remodelling, the Fiddler’s Inn still looked exactly as it had been built by Walt Haines in 1934. Photo by Valarie. Prohibition ended December 5, 1933, and beer and wine were again permitted to be sold to the public. As Walt cast about for another way to make a living, he saw that people were opening beer parlors, and he decided to try it himself. 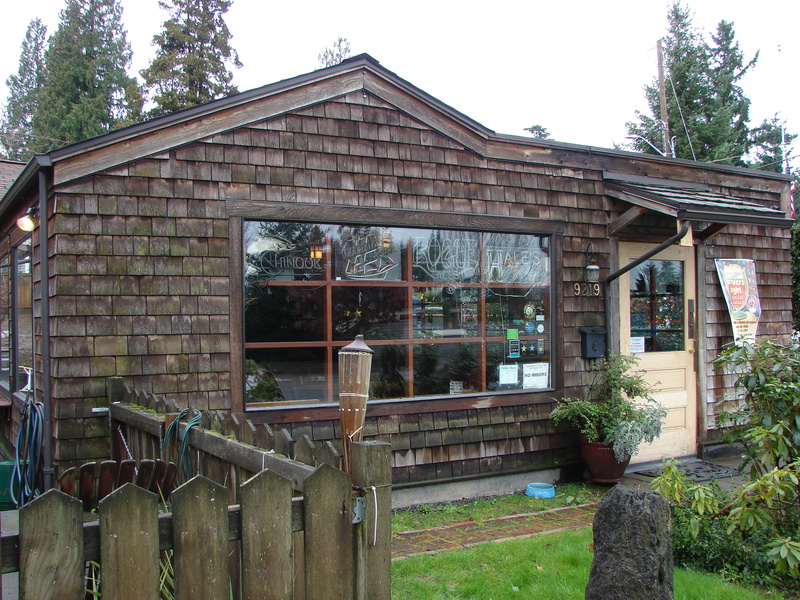 Thus the Fiddler’s Inn, on the corner of NE 94th Street & 35th Ave NE, was born. The tavern location was in the Morningside Heights plat which was being developed by a real estate company and which had quite a few houses. The tavern faced the arterial 35th Ave NE and was just one block from NE 95th Street, which was also being paved and arterialized at that time. There were several small stores and a gas station at the intersection of NE 95th & 35th. Walt Haines must have chosen the location for his new tavern because he thought it was in a growing and thriving business district. Walt built the Fiddler’s Inn himself, including two rooms on the back of the tavern where he and his daughter Gerry would live. Gerry was almost six years old and would be able to attend the new Maple Leaf School on NE 100th Street, just a few blocks away. Walt was in a hurry to get the tavern built so that he could open for business, but if he had known how long the Fiddler’s Inn would last, he might have taken more care with the construction. 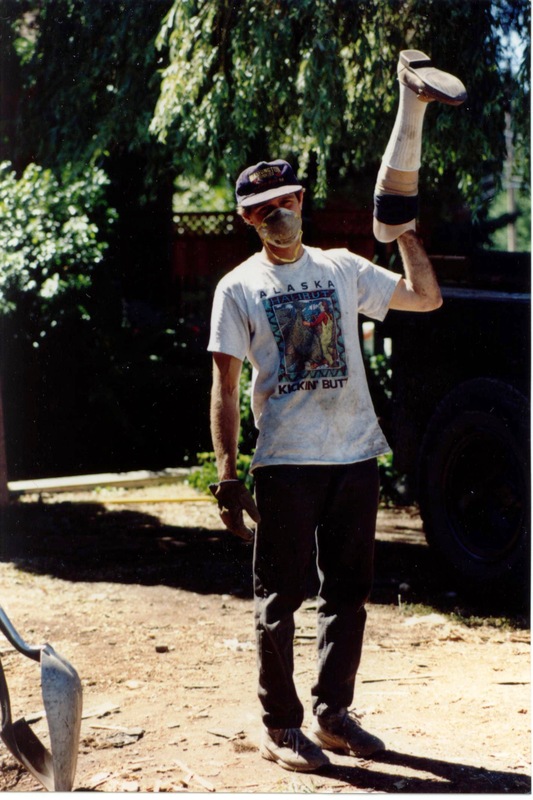 Gerry recalls him saying, “We don’t need to put a foundation under this thing!” The building remained foundationless with only a cement floor poured directly onto the ground for sixty years, until remodeling in 1994. Walt continued to play in various local dance bands while running the tavern in the 1930s. He even played in an all-girl orchestra, because they couldn’t find a girl tuba player! He played with some very fine groups in Seattle, such as Jackie Souders, Tommy Thomas and Vic Meyer. Walt passed up opportunities to travel with dance bands because he didn’t want to leave little Gerry. After he remarried in 1939, Walt Haines built this house behind the Fiddlers Inn, facing NE 94th Street. Photo date 1941, courtesy of the Puget Sound Regional Archives, repository of the property records of King County. Walt hired a bartender named Sid, who lived just a few doors away from Fiddler’s Inn. Walt and Sid were a real show-business team, and they used to clown around and entertain the customers at the tavern. One of the entertainments Walt used to conduct at the Fiddler’s Inn was the playing of musical spoons. He kept a box of spoons behind the counter and would teach the customers to play. Evenings at the Fiddler’s Inn were lively with singing and playing, with everyone joining in. In the 1960s after Walt Haines sold the Fiddler’s Inn, he worked with the manufacture and distribution of musical spoons. In the 1950s Walt Haines began developing musical spoons as a business and a salable item. It is not known how Walt Haines met Lawrence Welk, who was a bandleader and host of a musical variety show which ran on television from 1951 to 1982, but Lawrence Welk became a partner with Walt in the development of musical spoons as a business. Certainly, Walt and Mr. Welk had similar backgrounds: they both came from the Dakotas and had left farm homes to pursue musical careers. 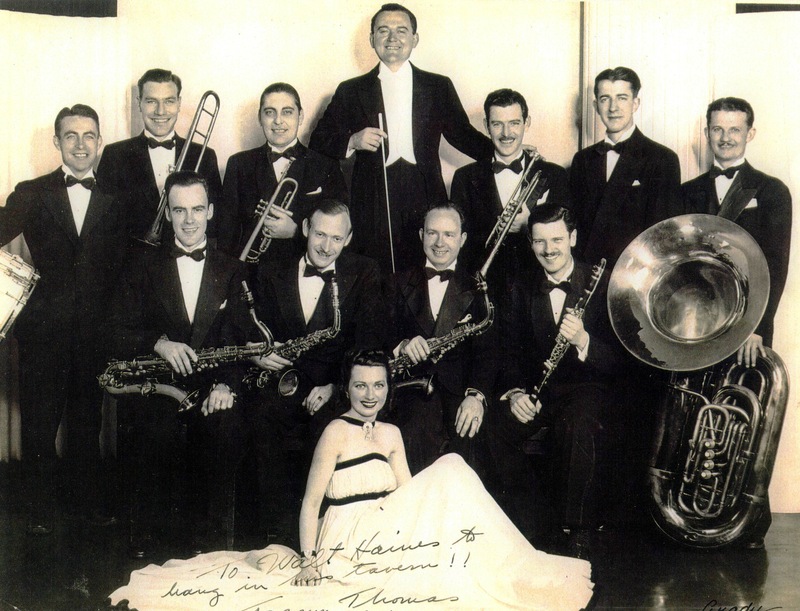 Both played with dance bands in the 1930s and 40s, so perhaps they were introduced by mutual friends. 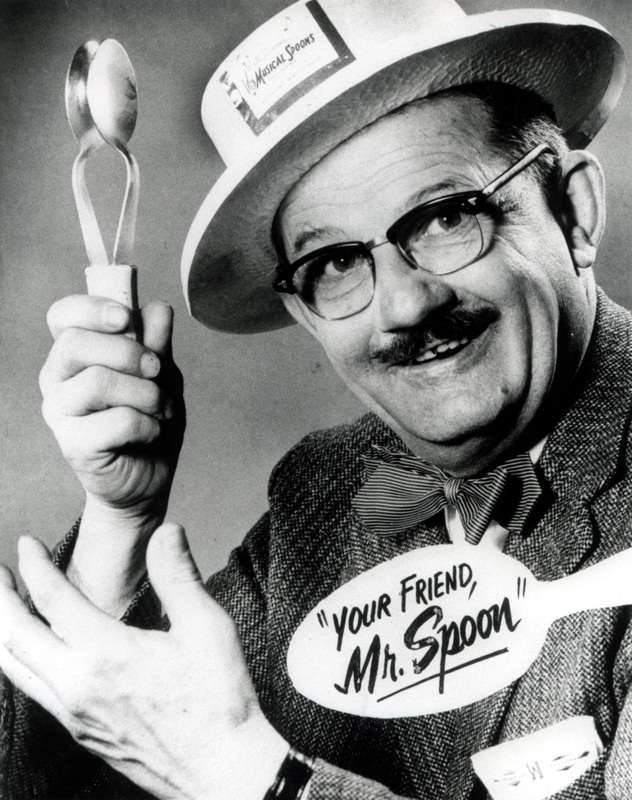 In the 1960s Walt moved to Los Angeles and worked in manufacture and distribution of musical spoons, for which he had patented a special handle. Lawrence Welk was the backer and investor of this business venture. Walt set up a factory in Los Angeles and also worked as the distributor, traveling and demonstrating the spoons at county fairs and at variety stores where the spoons were sold. Walt Haines with his third wife, Mary, in Los Angeles in the 1980s. 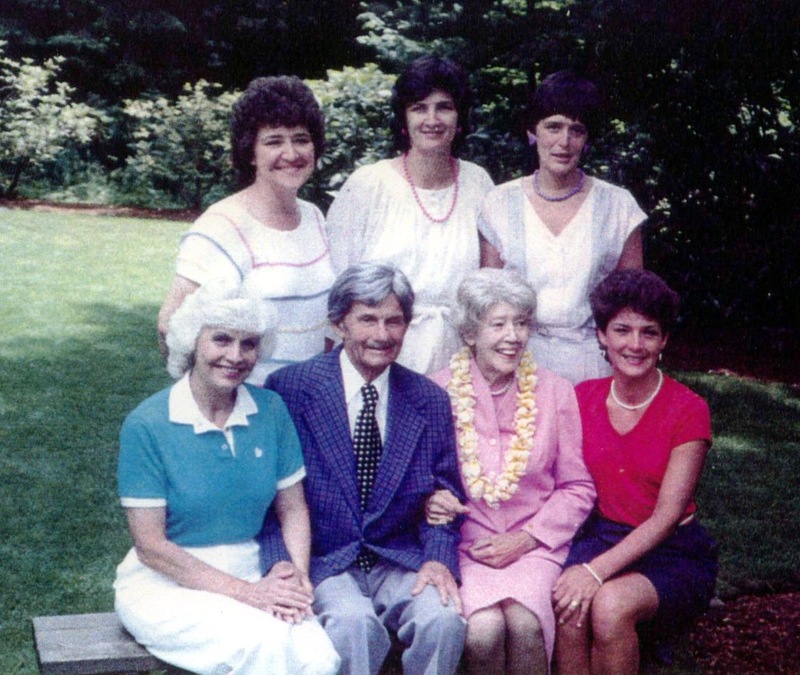 Walt’s five daughters are arranged around him clockwise in order of age. Photo used by family permission. Walt Haines spent the last twenty years of his life in Los Angeles. After closing down the musical spoon manufacturing business, Walt retired and lived happily with his third wife, Mary. As a young man, only sixteen years old and making his way in the music business in Seattle in the 1920s, Walt had unwisely taken the advice of other musicians that he would play better if he drank. From that time on, Walt struggled with alcoholism, overcoming the problem only in his later years when he cried out to God for help. God did help Walt overcome alcoholism and also sent Mary to be Walt’s supportive companion. Walt died in Los Angeles in 1987, and Mary in 1989. The remodelled Fiddler’s Inn retained the basic cabin shape while adding an upgraded kitchen. 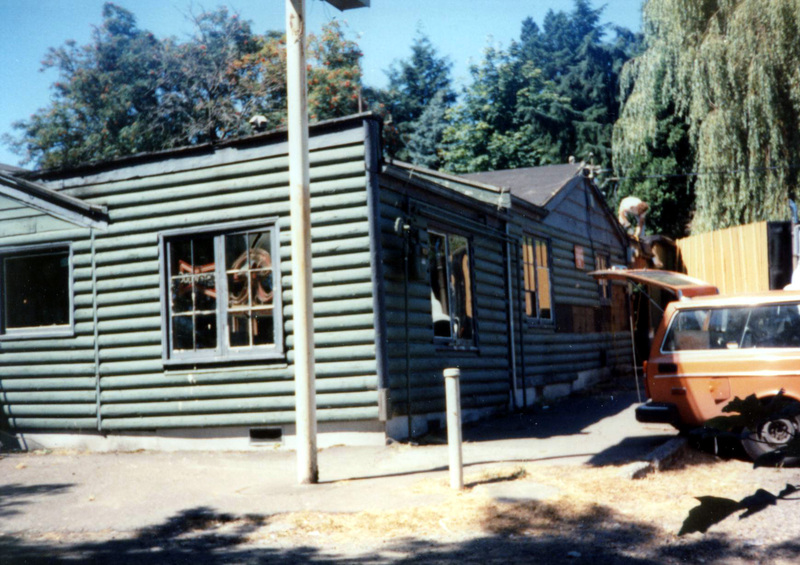 In 1994 a new owners group of the Fiddler’s Inn remodelled the tavern, keeping the basic “cabin” shape and reusing the interior wood paneling. The Fiddler’s Inn reopened as a no smoking venue with fresh-cooked food, craft beers and guest musical performances. Fiddler’s Inn is today a great neighborhood gathering spot in Wedgwood. Fiddlers Inn gets a shout-out: The August 2014 edition of City Arts magazine has a delightful article by Jonathan Zwickel, who captured the easy-going ambiance of the Fiddler’s Inn. This entry was posted in businesses, Neighborhood features, taverns and tagged Great Depression, music and entertainment in Wedgwood, Prohibition. Bookmark the permalink.